The Seismic Lokton 36 Grit Laser cut Metal Plate 11" x 11" Longboard Griptape Sheets are the sharpest, toughest and grippiest griptape you can slap on your longboard. The laser cut holes reduce the weight by 40%, with the edges of each pattern increasing the grip so you get the maximum lokton feeling. Noticeably sharper, tougher with stronger grip than the competition. The grip to stand up to heat and rain. 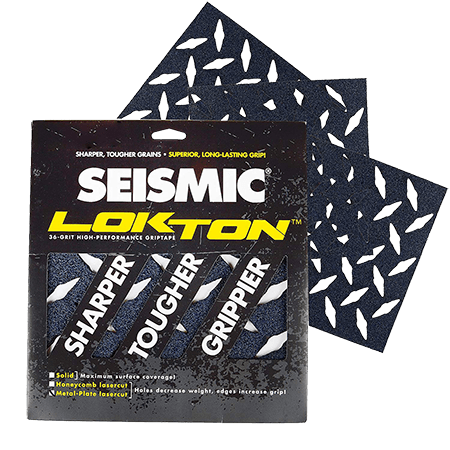 The Best grip in history...Lock it in with Lokton by Seismic.